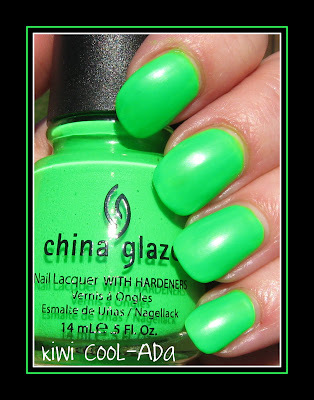 Here are my last two swatches from China Glaze's soon to be released (April) Poolside Collection, Towel Boy Toy and Kiwi Cool-Ada. I can't say that I have a favorite, because I was very pleased with all of them. The formula was decent, although some were a little thicker than others. The key for me, as I mentioned in my previous posts, was using a white base coat. You can see the other 4 shades in the posts below this one. 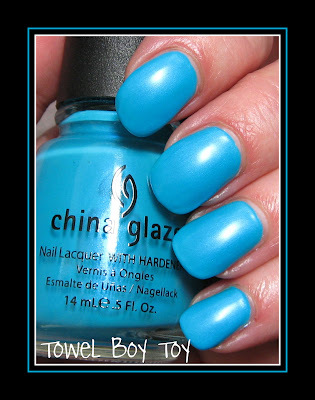 Above: Towel Boy Toy, the lone shimmer (which is quite subtle) in this collection, is a bright turquoise shade. I used 3 coats on these and no top coat. Below: Kiwi Cool-Ada is a vivid lime green creme that is definitely one of the brightest of the 6, although I'd say Yellow Polka Dot Bikini may take the prize for being the brightest one. Below: A family photo of the Poolside Collection. My husband took the afternoon off to do some yard work today, and while he was up on a ladder cleaning the gutters out, I was outside taking pictures of Towel Boy Toy. I asked him if I could take his picture to post with that polish, and well, he didn't see the humor in my request! He suggested I ask the UPS driver instead--hmm, have I made some comments that would lead him to think that? But he did think it was a nice shade. So, what do you think about this collection? Any favorites? Oh man. I have no idea what my favorite is. I love them all!! Your husband is funny! 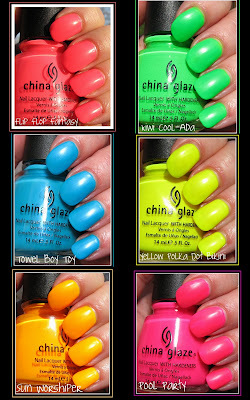 I love neons,so I think I'm going to get the entire collection :) They're all gorgeous. I like all of these polishes. At first I only liked the yellow/orange and the green, but they are all growing on me and I think I'll need them all. they remind me of stuff from my childhood (the '80s). Your husbands so funny and I guess he knows you must see the UPS guy frequently! I'm friendly with my UPS guy also. He's a real sweetheart named Sam. Very kind young guy. I bet he would take a picture for me! Love this collection but I don't think I'm going to buy any. Maybe! Tierney~I know, I kept think 'this is my favorite' everytime I tried a different one! They're all perfect in their own way. Brooke~they're are plenty of towel boys out there~ha-ha! Pinkginger~they covered a nice variety of colors in this collection, I can't think of any other colors I would have preferred. Skulda~I thought I'd only love Towel Boy Toy (the polish, that is! ), but I'm really happy with all of them. SilhouetteScreams~Sun Worshiper is getting lots of love!